RegData 2.0 is a newly launched regulation database that permits users to view regulatory statistics for hundreds of federal agencies. The chart below uses statistics pulled from the new RegData website to determine which federal regulators published the most restrictions in the year 2012 and compare the number of restrictions from these regulators in 2012 to the number of restrictions they published ten years earlier. The bars in the chart show the number of restrictions published by the ten regulators with the most restrictions in 2012 alongside those regulators’ restriction counts in 2002. 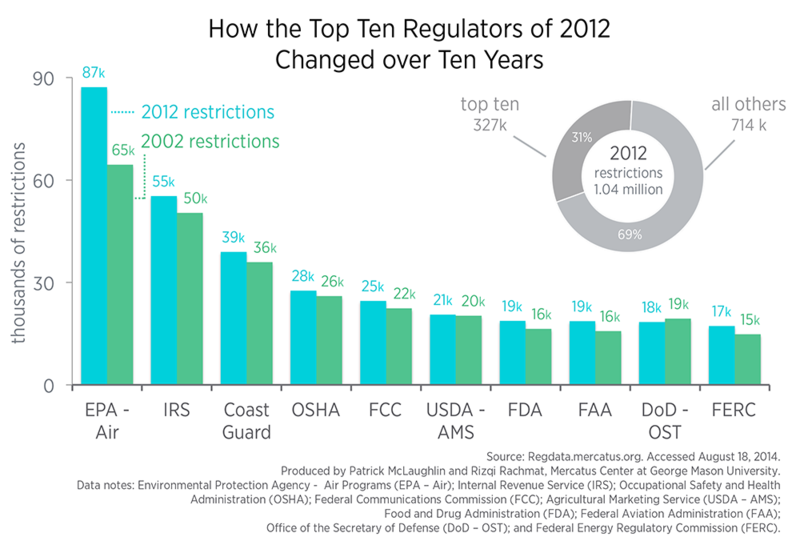 The doughnut chart shows that these regulators accounted for almost one-third of all restrictions published in 2012. RegData can compare agency-specific regulatory statistics in one year to another year, as done here; it can also plot year-to-year growth for all years between 1997 and 2012. As the figure above shows, growth trends can be quite different from one regulator to another. RegData objectively creates a “big picture” window into regulation. It measures not only that overall regulation tends to grow over time, but also which agencies account for that growth. Researchers and analysts can use the data created by RegData to better understand the causes and effects of regulation from specific agencies and on specific industries.